Season one is over, but we’re not yet a quarter of the way down this road. How did. Where. Can you make gargoyles out of any old smashed pottery? Is there a particular “agonized shambling reanimation” brand? It’s winter in NYC now, carrying on from the indistinct but undoubtedly forward-moving timeframe that’s been going since the pilot. And because this is fictional New York, we start with a sad local business owner and Uncle Ben impersonator being robbed for the third time in one month. Who will look out for the helpless, so on. Pop forward to 1994 NYC, where the gravitas of the phrase is somewhat lost on the younger generation because she doesn’t even go here they don’t even live in a castle anymore! Not that it seems to bother them overmuch, at least so long as there are movies to see. Goliath is considerably more broody about it, but he perks up at the idea of trailing after Elisa on patrol with her “clan” – protect and serve being the modern equivalent of the gargoyle creed (boy is it weird and interesting to watch this in light of the recent scourge of police brutality in the US). 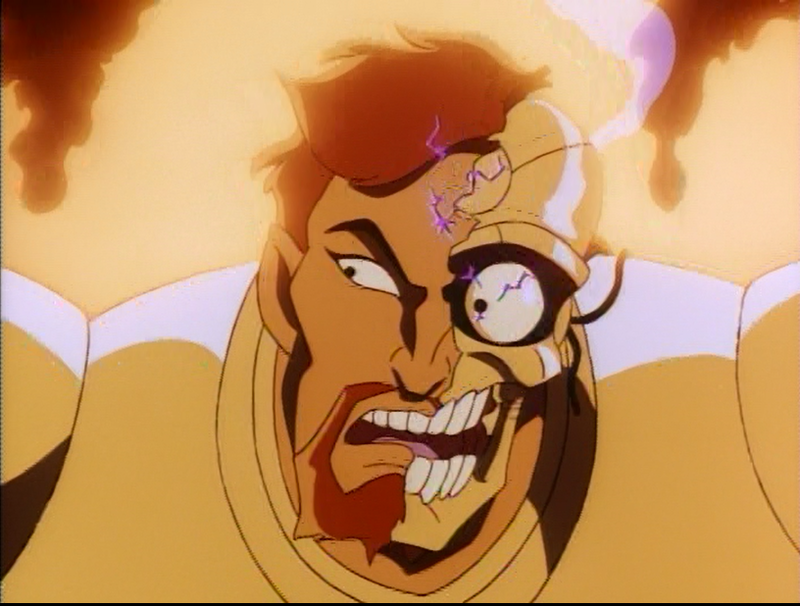 Elsewhere, Xanatos continues to have demonstrably more fun than anyone (almost anyone) on the show. He’s kitted out a rooftop tower in full 30s Frankenstein mode, seemingly just so he can give the big famous IT’S ALIVE line (though without the more often expunged “now I know what it feels like to be God.” I guess the whole “barefoot into hell” line spent any boundary-pushing dialogue for a while). Oh, and also he’s working with Demona to actually, you know, resurrect something on that painstakingly accurate slab. Mark it down: any moment where a fellow villain gets into snippy banter with Demona is bound to be a series highlight. The special thing about this new gargoyle is that he’s made with a combination of magic and science – which is a nod to the series’ own standing place at a crossroads of 90s technological revolution and the cultural myths and legends it will go on to delve rather heavily into, but also a rather apt look at the heart of this sort of playing-God narrative in general – a subgenre that mixes a leery WHAT HATH SCIENCE WROUGHT conservatism with a sort of bated-breath fascination at how human innovation can bring “magical” ideas to life. If you found your “important unique character design” senses tingling during the flashback then pat yourself on the back! This resurrected gargoyle is indeed our same new fellow, going by the name Cold Stone. Appropriately, his internal organs seem to be mix and matched in a slurry of robotic stitching. In other relevant news from the first act, Matt and Elisa are visiting the poor bedeviled shopkeeper. Well, Matt is visiting. Elisa and Goliath are talking through tiny iPhone earbuds and aweing at how neato and advanced the technology is. The trip lasts long enough for the two of them to have a nice conversation about serving one’s community even at personal risk to oneself before the plot comes in and tells thematic contemplation to go back and sit in its corner. And you know what that means – yes! We’re returning to Obvious Silhouette Corner, courtesy Cold Stone. Apparently the plan was just to tell him Goliath was responsible for his death, pat him on the back and show him the door, figure he’ll get to Goliath with all his organs still inside (joke about unarmed assailants goes here, then goes back out again because that’s a topic of great gravity not so much for a silly analysis of good cartoons). Also, bullets bounce off his skin so he has that going for him. The actual design on Cold Stone’s android form doesn’t quite measure up visually to the amount of horrified reactions it gets in universe, but then I have to stop expecting everything I watch to measure up to mid-80s Cronenberg. What it does do is compensate quite well with constant little touches of uncanniness: the desynched movement of his various limbs and eyes, the mechanical parts occasionally moving independently of their fleshy roots, and the wavering of his voice from normal to robotic go a long way to impressing the horror in a streamlined design. In fact, a lot of this episode’s strongest moments are its littlest. The battle in Times Square is most gripping when the punching stops and the standoff begins, with Goliath, the trio, and (implicitly) the cops on one side and Demona, Xanatos, and the robot squad on the other. Demona and Xanatos’ uneasy rivalry screams of betrayal to come, a natural outcome of their oil and water approach to villainy – while they’re both adaptable survivors, Demona’s shifting grasp of what constitutes a “real” gargoyle is pushed by her blind hatred (if she sees her own moments of hypocrisy, she doesn’t grasp their importance); meanwhile, Xanatos doesn’t yet have anything he believes in deeply enough to let it override his calculations, and his willingness to lose if it suits a longer con is what ultimately keeps putting him on top. Likewise, when the fight moves to the bridge (because like DBZ before it, there’s a lot of talk about being considerate to cityscapes) the most powerful moment is the quietist, as Goliath’s muddled thoughts on the meaning of protection and community translate to awakening Cold Stone’s own loyalty. The fakeout shot of the hands drifting past one another, separated by a sizable chunk from the actual change of heart, is a really nice touch. When they come up you might be counting down the seconds to the inevitable tragic turnaround, but the exchange between the gargoyles is worth the concentration. The idea of living versus surviving has lurked at the background of Goliath’s arc all season, with each potential step forward hamstrung by that reluctance and hold to tradition. Having it laid plain in so many words by someone else proves to be a great moment of clarity, and more besides: the idea that Demona is not just The Evil Gargoyle but has become an empty shell because she no longer cares for anyone but herself. In all her attempts to grasp at what she’s bereaved over losing, any clarity she might’ve had is lost in that great, sucking pit of aimlessness and hate (meanwhile, gaining people he cares for is the absolutely key turning point in making Xanatos anything like a human being). It does not take nearly the length of that paragraph for the tragic death to come about, by the way. Cold Stone takes a shot meant for Goliath and is knocked (somehow??? The physics are of minimal priority here) into the water. Recognizing that what he had and who he was is gone, even the bit of it that seemed to return, Goliath declares the whole isle of Manhattan to be under gargoyle protection. Presumably the surrounding boroughs saw a considerable uptick in crime within a week. And that’s season 1! A surprisingly well-contained character arc for Goliath and an incredibly strong thematic finish that leaves threads open for future exploration – essentially, a more successful version of what the pilot didn’t have time to do. But ah, it’s the second season that really gets a chance to shine. You can tell because the DVD has a fancy slipcover. As an aside, the age on this DVD is baffling. There are adverts for Proud Family dvds, folks. Oh! And they also had a little more budget from Disney, so there are nice things like episode introductions by Greg Weisman. I’m not going to do full transcriptions, but I promise to report back on the subject now and then. But I digress. We’re here for the point of this episode, which is the excellence of Fox. Oh, and also that opening-credits monologue thing I warned you about is a thing now. It’s really not that bad (and very pragmatic), but it does get repetitive a lot faster than the plain music did. Following on the “seriously did you get all this” recap, we open with an individual in a mecha-coyote suit breaking into…looks like it might be Rikers Island? I’d lay bets (though I suppose it could also be Alcatraz), given that’s waaaaaay too good an accidental in-joke to pass up. His powers include scaling sheer walls, melting metal bars with lasers, and sending out sound waves that cause people to think that they’re melting. And somewhere, Jonathan Crane started salivating uncontrollably for no adequately explainable reason. Our shiny new addition is here to break the Pack out, and 80% of them are all for it. Not Fox, though. Presumably she knows she’s already won the episode with the line “Nietzsche’s too butch,” and will be staying put to finish No Exit in peace (perhaps she is also leery of Hyena’s mystical clawgloves, which have gained the power to totally disappear between shots). The Pack-sans-Fox escapes in an all-terrain ship that would do the X-Wing proud, and I am willing to bet that every one of you watching this for the first time has reached the properly paranoid state where you wondered “wait, is this guy just Xanatos?” But listen, he can’t be inside every mech suit that comes along. And if you believe that…so on, etc. Elisa brings the escape news to the gargoyles, hand in hand with the baffling revelation that “somebody dressed in black” was the description of Coyote that made it off the island. Wow. Wow this prison is astonishingly lax (yes I know mind melting radiation rays, but the whole damn island didn’t get hit with them). Back on the Ship of Steroids, a brief power struggle reveals (drum roll!) that your paranoid instincts have in fact been perfectly trained. Ta da! One Xanatos under that helmet. And props to Frakes’ voice acting here – while his breezy quips are pretty identifiable under that hood, once he starts explaining his “revenge scheme” which is “not a trap” and “totally” “legit” “you guys,” there’s an added element of punctuation to his lines that mimics the Pack’s own overly aggressive communication, and the vocabulary drops a notch in favor of more direct verbiage. Knows how to play a crowd on a lot of levels, that David Xanatos. 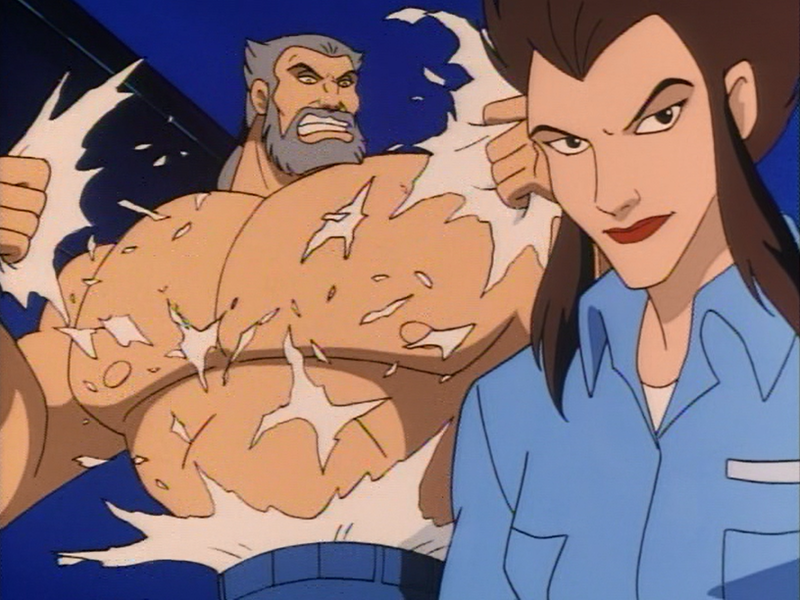 Speaking of working a crowd, there is a totally perfunctory scene of the gargoyles breaking into Xanatos’ place only to be redirected to the Pack’s studio, but Owen is such a delightful smarm through the whole thing. Mr. Business is totally relishing his chance to drop ominous lines after being on the sidelines for so long, and the performance is audibly more menacing than his usual clipped tones. These two are having fun putting on a play, and they both know it, and I love this little evil family. In more seriously worrying news, Lex’s undercurrent of bitter resentment against the Pack has become a full blown vendetta, blinding his better judgement and clouding over his sense of justice and usual idealism. It also means that he and Brooklyn (and Bronx, but he’s not much of a character so much as a weirdly cute scene accessory of yet) take the full force of a fully upgraded Pack. Which likewise frees them up to be used as bait during a midnight confrontation on a tanker in the bay. If you were wondering, Hudson absolutely steals the award for single best line delivery in the ensuing fight. Ah, but what’s this? While your paranoia is developing, young padawans, it is not yet mastery: this Xanatos is actually a robot, which we learn after Bronx tears half his face off in full view of the camera. A move made with the total expectation that that was a soft, meaty human. Enjoy that thought. And a full onscreen beheading, too. S&P frequently confuses me, I’ll be honest. Xanatos robot or no, the Pack manages to scramble out in that swanky new ship, and Lex is too busy saving his, y’know, family to take them down with that plasma rifle. Even the robot head makes a clean getaway, blasting off into the night with actual blasters that were built into its neck. Because Xanatos. Aside of Lex’s character growth, of course, the whole thing was beside the point! Getting the Pack out was entirely a diversion to make Fox look good by comparison and get her paroled early. And now she and Xanatos are free to hug and kiss in all of the ridiculously fancy plotting vehicles he owns. True facts, it is adorable. Terrible bad for our protagonists, but adorable.